Dutch jurist and deputy; born at Amsterdam Dec. 29, 1844; died at The Hague Feb. 13, 1901; LL.D. Leyden 1869. Hartogh settled as a lawyer in Amsterdam, and soon became one of the capital's most prominent leaders of the Liberal party. In 1886 he was elected to Parliament as a member of the Second Chamber for Amsterdam, which position he occupied uninterruptedly till his death. Hartogh introduced a bill on civil procedure, which was accepted after strong opposition in the First Chamber on July 7, 1896. He was also successful in securing certain rights for women, particularly as regards proceedings for divorce. 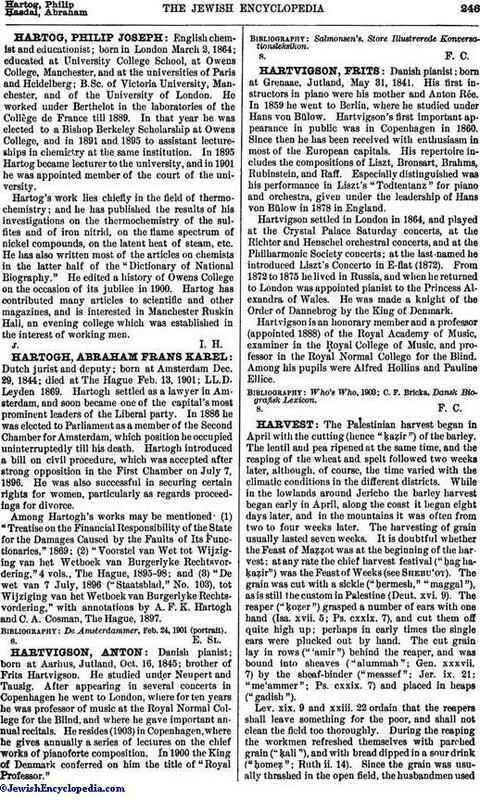 Among Hartogh's works may be mentioned (1) "Treatise on the Financial Responsibility of the State for the Damages Caused by the Faults of Its Functionaries," 1869; (2) "Voorstel van Wet tot Wijziging van het Wetboek van Burgerlyke Rechtsvordering," 4 vols., The Hague, 1895-98; and (3) "De wet van 7 July, 1896 ("Staatsblad," No. 103), tot Wijziging van het Wetbock van Burgerlyke Rechtsvordering," with annotations by A. F. K. Hartogh and C. A. Cosman, The Hague, 1897. De Amsterdammer, Feb. 24, 1901 (portrait).